Hundreds of mourners have paid tribute to one of Sri Lanka's most renowned rights activists, Sunila Abeysekera, at her funeral near Colombo. Ms Abeysekera, 61, who died of cancer on Monday, worked with both Sinhalese and Tamils during the long conflict that divided Sri Lanka. She was a leading campaigner for the rights of women, workers and farmers. During a four-decade career she received numerous international awards, and also faced death threats. The BBC's Charles Haviland in Colombo says her mother and children led hundreds of mourners at the funeral. Rights activist Ruki Fernando, who was at the funeral, said Ms Abeysekera transcended the ethnic divide. "She was able to combine a very humane and compassionate approach [for] people who were victims of human rights violations with legal frameworks both local and international. And for me this is a very rare combination," he said. 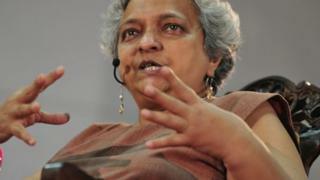 Sunila Abeysekera was one of several human rights campaigners selected to address the United Nations Human Rights Council at its opening session in 2006.